Congressman Charles Diggs of Detroit and his associate, Goler Butcher, as he resigns from the U.S. delegation to the United Nations in 1971 to protest Nixon administration support for South Africa and Portuguese colonialism. Photo courtesy of South African Research and Archival Project, Howard University. In the 1970s and 1980s, the Congressional Black Caucus and the Subcommittee on Africa of the House Foreign Affairs Committee were the two key government institutions in Washington keeping a consistent focus on African liberation. Without the efforts of a handful of individuals, however, this probably would not have happened. Talk to anyone familiar with the congressional scene on Africa during these years, and you will hear two names again and again: Representative Charles Diggs Jr. of Detroit and his first staff counsel for Africa, Goler Teal Butcher. Sources for this profile include a biography of Diggs by Carolyn DuBose (1998) and an article about Butcher by J. Clay Smith Jr. (2000). Members of Congress are under constant pressure to pay attention to issues close to home. This is particularly true of those in the House of Representatives, who are elected by specific districts within their states. Focusing on foreign policy rarely brings political rewards or campaign contributions. But Africa became a central focus for the Congressional Black Caucus, which grew from five House members and a lone Senator in 1968 to 23 House members and no Senator two decades later. This happened largely because of the direction set by the CBC's founder, Charles Diggs Jr., with strong reinforcement from his younger colleague from California, Ronald Dellums. The tradition of strong, competent staff for the House Africa Subcommittee, which continued through the 1980s under Diggs's Michigan colleague Howard Wolpe, was launched with the early leadership of Goler Butcher. Elected to Congress for a first term beginning in 1955, Diggs came from a prominent Detroit African American family. His father had established a leading mortuary business and had been one of the black pioneers in state Democratic Party politics. When the younger Diggs came to Congress, he was one of only three African American members, and he was conscious of the obligation to stand up for black people everywhere, not just in Detroit. His grandfather, a Baptist pastor in Mississippi in a county next to the one where Emmett Till was killed, had been a missionary in Liberia for a year in the early 1880s. Diggs gained national attention from his presence at the Till trial in 1955, and he continued to take a leading role on national civil rights issues as he gained seniority. In 1969 he took the initiative to create the Congressional Black Caucus. He took on the chairmanship of the congressional subcommittee that oversees the District of Columbia in 1972, and he played a key role in bringing local elected government to that black-majority city that still lacks its own voting representation in Congress. Diggs also became the first black congressman to visit Africa when he was chosen to join the U.S. official delegation to Ghana's independence in 1957. He returned to Africa on his own to attend the All-African People's Conference in Accra in 1958. In 1959 he became the first black to serve on the House Foreign Affairs Committee. He joined the Subcommittee on Africa immediately and became its chair 12 years later, in 1971. At just this time, the incoming Nixon administration was replacing official indifference toward white minority rule in Southern Africa with a more decisive tilt in favor of the white regimes. 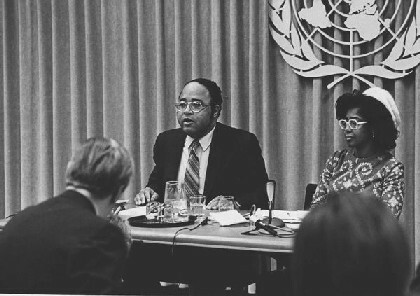 In 1971, as a member of the U.S. delegation to the U.N. General Assembly - part of a tradition of bipartisan representation - Diggs decided it was time to make a decisive stand against U.S. policy. On December 17 he held a press conference at the United Nations. He denounced the recently signed Azores agreement with Portugal as " a partnership in the subjugation of the African people" and announced his resignation. Administration officials, including then U.N. ambassador George H. W. Bush, were outraged. In the 1970s Diggs traveled repeatedly to the continent. He organized committee hearings on a wide range of African issues, forcing administration officials to present their views and providing a forum for critics. The foundation for this work was laid between 1971 and 1974 by Goler Butcher, who had already won a reputation as a leader in international legal issues. Graduating from the Howard University School of Law in 1957 - the sole female graduate - she joined the legal staff of the Department of State in 1963, the first black person to serve in that unit. At the Africa Subcommittee, she was key to ensuring that questions addressed to administration witnesses and criticisms of administration policy were solidly based on detailed data. Butcher left the subcommittee staff in 1974, but she continued her involvement with African issues and her ties with congressional allies. In 1975 she was one of the lawyers challenging a Civil Aeronautics Board ruling that allowed a South African Airlines flight to New York. During the Carter administration she served as assistant administrator for Africa in the U.S. Agency for International Development, and she then became professor at the Howard Law School, where she stayed until her death in 1993. She continued to provide advice on Africa to members of Congress and to groups such as the Lawyers' Committee for Civil Rights Under Law. In 1989 she served as an election monitor in Namibia. Diggs was forced to resign from Congress in 1980 after being convicted of fraudulent financial mismanagement of his office budget. Many were convinced that the conviction was unjust and that white colleagues guilty of similar abuses would not have suffered a similar penalty. In the 1980s he withdrew from political involvement. But he never lost the respect of his colleagues or of Africa activists, who paid tribute to his work at his death in 1998. Diggs and Butcher are significant not just for their individual commitment and contributions, but for illustrating the complex ways in which Africa solidarity moved into the mainstream as the anti-apartheid movement grew. They were among a much larger cohort of African American politicians and professionals who gained entry, if only marginal, into the corridors of Washington power in the wake of the 1960s civil rights movement. Diggs and Butcher paved the way, in the words of Sylvia Hill (2004), for " young black activist types, . . . internationalists in some sense, whether they defined it as Pan Africanist or anti-imperialist, . . . [people who were not] careerist in the traditional sense of the word." This group may have been a minority, even among their African American peers in Washington. But they retained bonds of mutual trust with the activist groups. The continuous interchange between activists and Congress over two decades was one of the keys to the capacity of the anti-apartheid cause to make an impact.